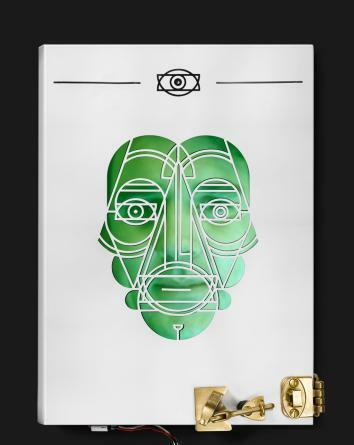 This book only opens if its facial-recognition software decides you are nonjudgmental. What does your face say right now? We’ve all heard the “don’t judge a book by its cover” truism, but in the not-too-distant future, books could judge you. A new project by Thijs Biersteker of the Dutch design agency Moore, “The Cover That Judges You,” lets a book decide for itself who gets to read it. A prototype created for the Art Directors Club Netherlands, the cover remains locked unless the reader approaches it without pre-judgment. The prospective reader must line up her face with an outline to be picked up by the cover’s facial recognition system. If the scan decides her face is suitably neutral—neither too happy nor too skeptical—an audio-pulse is sent to its Arduino control board, unlocking the book. It’s an admirable sentiment and an impressive product, but it might leave you feeling a little creeped out. And if you’re not, you probably should be. There’s something of an arms race going on among companies eager to make our technology more in tune with our emotions—and reacting to your subconscious feelings, projected by crinkled eyebrows or a grimace, is the first step. A recent Wall Street Journal article, for example, chronicled a group of start-ups that are busy creating vast visual databases of human expressions and algorithms that can recognize our deepest emotions, for a price. While their collections have mostly been used for market research so far, advertisers and retailers are no doubt eager to take advantage of this information about microexpressions, based off work done by well-known psychologist Paul Ekman. The piece mentions at least one store that is testing security camera software intended to pick out the emotions of shoppers entering and exiting. Even more troublingly, Eyeris, one of the companies profiled in the piece, has reportedly struck deals with unnamed federal law-enforcement authorities. There’s also been growing speculation about how everyday devices and apps could use your facial expressions. The new Amazon Fire Phone, for example, has four front-facing cameras, so that it knows where your head and eyes are at all times—raising the possibility that it could one day tell if your eyes are lingering on the webpage of a certain outfit or book title. The emotion analytics company Affectiva, the Journal reported, is also working on a platform with a video chat service OoVoo that could determine people’s emotions mid-call. When every tech company and big box store in America is better at sensing my disgust or desire than any FaceTime buddy, being judged by a book could be the least of our troubles.